Zimmerman was not discouraged and in his spare time built a number of test models, including a rubber-band powered flying version. His original plan was an aircraft which carried three crew, in a prone position to allow maximum streamlining. The idea was subject to a 1938 patent he filed. This revealed problems with the trailing edge "ailevator" design, and horizontal "flying tail" stabilisers were introduced. 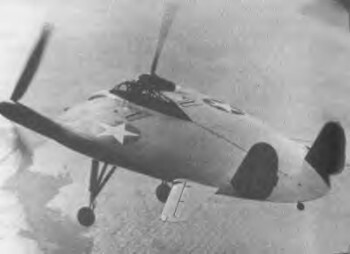 After full-scale wind tunnel tests in September 1941 at Langley Field, Va., the Navy asked Vought to build two military versions of the aircraft, to be designated XF5U-1. One would be for flight testing and the other for static testing. The first flight took place of a V-173 on 23rd November, 1942. Soon after takeoff, Boone T. Guyton, Vought's chief test pilot, found the controls sluggish, and had to struggle to make a wide turn back to base. Otherwise the design was a promising one, and a wooden mock-up XFU5-1 was completed the following June. Flight tests progressed slowly but satisfactorily. On July 15, 1944, a development contract consolidated the V-173 and XF5U-1 programs. By the end of the V-173 flight tests convinced Boone Guyton and designer Zimmerman that the design had potential. They had faced financial and technical problems but had persisted. One major problem was the propellers, initially the same as those used on the F4U-4 Corsair. These had to be replaced with flapping blades to avoid vibration; a four-bladed design was finally produced, each propeller having one pair of blades staggered ahead of the other pair set at right angles. The twin 1,350 hp Pratt & Whitney engines gave the XF5U-1 an excellent speed range of 40 mph to 425 mph, much better than the usual 1 to 4 ratio of landing speed to top speed of other good designs. Water injected engines gave a 20-460 mph range, and gas turbines allowed 0-550 mph. The ship carried 261 gal. of internal fuel, and six 20 mm cannons, three stacked vertically in each "wing root". 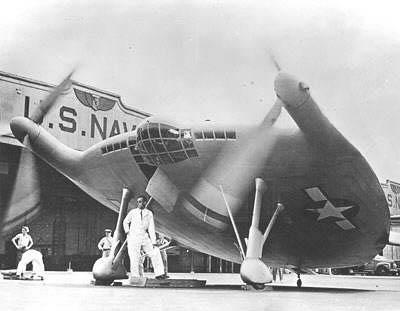 In June 1947, Boone T. Guyton flew the V-173 to Floyd Bennett NAS for a Navy Day display. As he neared the base, bathers on the Long Island Sound beaches saw a silver and yellow disc moving slowly overhead and rushed to report a "flying saucer". Guyton participated in the display then returned to the Vought factory at Stratford, Conn. This was the final performance of the Flying Flapjack. On March 17, 1947 the Navy had cancelled the XF5U-1 development, preferring to go with jet aircraft. The static test aircraft had already been demolished during laboratory tests, and the Navy ordered destruction of the flying version. Its engines, instruments and other salvageable items were removed and the airframe placed under the steel ball of a demolition crane. The first few drops failed to dent the aircraft. After careful measurements the ball was dropped between the main beams and spars, and the aircraft was eventually reduced to crumpled wreckage. The V-173 was approved for display at the Smithsonian. R-200-7 engines, each 1,350 hp. 388 mph at 20,000 feet.